TAG 15 Random Facts About Me! I was recently tagged by Bailey from Iknowallthewords to do this tag. It's the first tag I am actually personally tagged to do so it's exciting! This tag is a little difficult for me, as there is no clear questions, just to list some random facts. So I had to think for a while about what I would consider random enough facts! Rules: Come up with 15 random facts about yourself and share them with the blog world! After doing this post tag 5 other bloggers to do this! 1. I have shoes in almost every colours you can think of ( except pink, green and grey, which are bizarrely my favorite colours, and orange). But name it I have it: black, white, brown, beige, blue, red, yellow, purple, gold, silver, bronze, turquoise, I might forget some. In my yearbook from college last year, the intro to my text was about that. This is not my own collection, but it looks like that, with a little less shoes... Sorry I can't credit the image, as it was in my computer at work! 2. I am a little obssesive. You can refer to number 1. If I like something, then suddenly I throw myself into it and I want it in every color/ do it/watch it all the time. This is the case now with nail polishes... I want this one now! So at one point I'll decide enough is enough, I will go cold turkey for a while (last time it lasted a good few years! ), then I'll decide I want in again. 3. Which is leading to numer three! I am a true gemini! I like opposites. Always been like that. I had a love/hate relationship with my bachelor's degree program, I like things but at the same times not. I can also be either really shy or super extrovert, depending on how I feel that day. 4. I can be serious though. Last year at school I was awarded the "most serious person" award. I was so stuned that my speech was an inside joke between me and my friends, proving everyone wrong! But really, I can be serious. 5. I am always worrying. Even though I know I planned my things properly, I will worry. Even though I tell myself: "Everything is going to be ok", I still worry. When I left my parent's place at Christmas, and I had to take the bus to get to Montreal, I thought: What if I miss the bus? Then in Montreal I had some time to browse around, I was still thinking: What if my plane was actually leaving at 7:45 in the MORNING instead of at night? What if I arrive late at the airport? 6. Although I dread moving, I have lived in a few different places in the past 8-9 years: I am from a small town in Quebec (which shall remain anonymous), than I moved in Montreal, then Vancouver, then Quebec City, Brussels for two months and now I am in London. 7. I have known my boyfriend for 8 years now. We are an item since 7 1/2 years. When I think about it, it is a long time, but living it is not, as we were appart for long periods of time, when we lived in different places (5-hour plane journey, monthly get-toghether is not an option). 8. I dream of owning my house soon. Dear boyfriend is an architect, so I always tell him: "Oh you know, in my house, you're going to have to draw this (en-suite, walk-in). 9. Even though I really like girly things, and I consider myself girly, I have a "tomboyish" side. I ususally end up with guy roommates, friends, colleagues. Somehow, I always end up "one of the boys"! I don't know why, but it's like this. 10. I like singing and karaoke. When I'm in a car, I like to sing along to the radio. I am not the best singer ever, and I don't do it to annoy people, I usually do it when I'm alone or with people I know, I don't sing in front of strangers! 11. But I hate Glee. I hate that name, the show, and anything in relation to it. Actors from Glee always sound like it's a cult when they do interviews: "We are all friends, bla bla bla, we help children who are marginalized, yadayadayada. Plus, it reminds me of the high school choir in my hometown, they were always singing in Tim Hortons, it was the most annoying thing!!! 12. 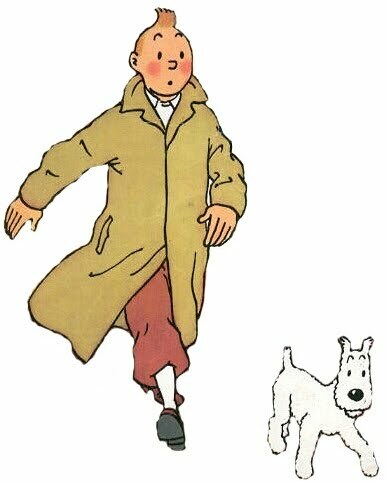 When I was 4, I wanted to marry Tintin. So I read all the albums over and over, and I still enjoy it. Every Christmas, when I go back to my parents, I have a Tintin marathon. That also explains, in part, why I did my internship in Belgium! 13. I am a magazine junkie. I am always reading something, and I currently have a magazine backlog. I try to tear up pages I want to keep, but because I have a backlog now, I am not sure which mag I have finished, which pages I want to keep, so I have to recheck the mag and it takes time. Hopefully next week it will be over!! 14. I hate Twilight! I read the first book because I was curious to know what was the fuss about. I had difficulties to read it because the characters and so hatable! I hate them. But because I started reading it, I hate to read all 4 of them, I'm like thatL I hate to start and not finish something. 15. Bridget Jones: this is pure genius! Again, I have read the books and watch the movies over and over! My boyfriend, and even now my flatmate Ben, are fed up with this. But I don't even watch it when they're there! Anyway, I like the books and movies because it's funny, and also because every girl can relate. It's not really for the "quest for love" plot that I love it, but more for the "I don't feel I'm meeting some expectations" feeling. If I want to feel good about myself, a little Bridget does the trick. If I feel bad about my job, or my relationships, I can always watch the movie and tell myself "I am not that bad". Can't wait to read what you will write girls! Eeek! I LOVE Glee & Twilight :P I'm the complete opposite haha! Thank you for tagging me! I've already done this post! It's hard to do isn't it! I am such a worrier too, even if I don't have anything to worry about, I'll find something, anything. Haha! Yes, it was hard to do, but after thinking about it for a few days and having a fe ideas, I started on it and did most of it!